Published today, the British Business Bank’s UK Business Angels Market report, produced with the UK Business Angels Association, reveals a clear regional disparity in terms of where Angel investors are based and where they invest. The survey found that 57% of business Angels are based in London and the South East, with 35% in London and 22% in the South East. Furthermore, nearly a third of business Angels’ investments are made in London (31%), followed by the South East (12%). Data from the survey indicates that the Business Angel market is maturing, both in terms of Business Angels’ experience and the volume and value of investments made. More than half (56%) of those surveyed have more than five years’ experience as an Angel investor; 40% hold their investments for more than six years; and the majority said they held an investment portfolio of more than five companies. An older cohort of Business Angels also emerges from the survey, with 21% aged over 65 years old and 75% aged over 45 years old. The UK Business Angel Market report revealed that the median initial investment by a Business Angel is £25k with a median follow on investment of £7.5k. 79% of Business Angel investments are made as part of a syndicate with other Angels. The four sectors most-favoured by Business Angels are Healthcare (27%), Life Sciences (26%), Fintech (25%) and Software as a Service (24%). The findings reveal that Business Angels’ investment decisions are based on a range of factors, including their assessment of the individuals running the business. 93% surveyed thought it was essential that entrepreneurs had relevant skills and experience, while 89% emphasised the potential of the business to achieve growth and scale as a key factor. Keith Morgan, British Business Bank CEO, said: “Angel investors play a vital role in the economy, bringing patient capital, business experience, and skills to support the growth of smaller businesses. Their funding and expertise can be the key to unlocking rapid growth for companies wanting to expand, diversify, or enter new markets. Small Business Minister Andrew Griffiths said: “The findings from today’s report provide encouraging news to small businesses who are looking to grow, in a market where there is often a shortage of funding. 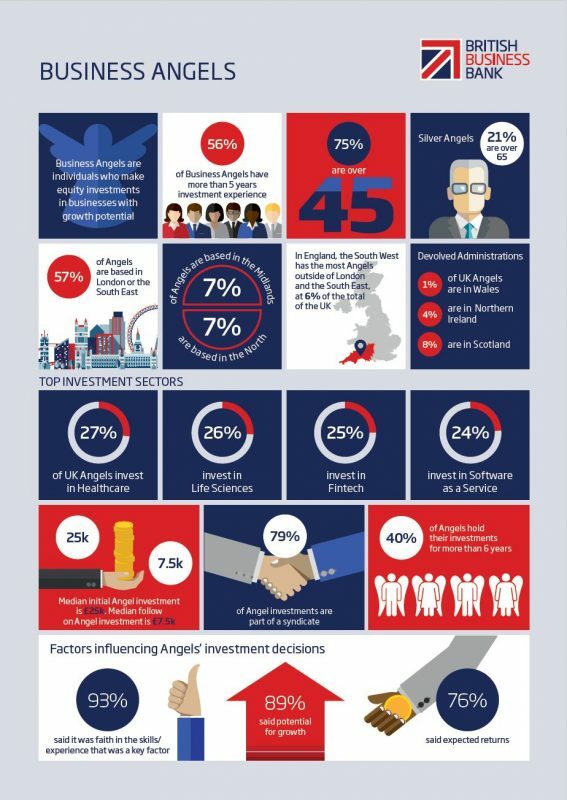 Jenny Tooth OBE, Chief Executive, UK Business Angels Association said: “The findings of this report show extremely positive signs of continuing growth in the angel market, but many regions continue to show an underserved level of angel investment. We therefore welcome the British Business Bank’s implementation of this major new commercial investment programme to stimulate new regional business angel clusters. At UKBAA, we are complementing this important initiative with capacity building actions, including new regional Angel Hubs, combined with our new national e-learning programme on angel investing”. To address the regional disparities revealed in the survey, the British Business Bank is establishing a new commercial programme to support developing clusters of business angels outside London. Alongside its existing programmes, the bank will increase its physical presence across the UK by leveraging regional angel groups and establishing a network of regional relationship managers. It is expected that these new initiatives will help deliver further improvements in the UK’s Business Angel finance ecosystem, making it more dynamic and diverse. The British Business Bank is currently supporting almost £4.6bn of finance to more than 70,000 smaller businesses and participating in a further £7bn of finance to mid-cap businesses (as at March 2018). As well as increasing both supply and diversity of finance for UK smaller businesses through its programmes, the Bank works to raise awareness of the finance options available to smaller businesses. It has published the Business Finance Guide (in partnership with the ICAEW, and a further 21 business and finance organisations). This guide impartially sets out the range finance options available to businesses – from start-ups to SMEs and growing mid-sized companies. Take the interactive journey at www.thebusinessfinanceguide.co.uk/bbb or download/print a copy.